One common misconception about tile showers is ‘If it’s tiled, that means it’s waterproofed”. While the surface of the tile is generally impervious to water, the grout and setting materials aren’t. Water routinely moves into and through grout lines, thinset, and mortar/mud beds. Here’s an example of that sad reality in action in a classic situation: 1950’s Ranch, Tub converted into a Tub/Shower by the addition of tile in a mud bed style of installation. Looks like it’s in great shape, right? Here’s the same area after the tile was removed. Water had seeped through the grout lines into the mud bed, eventually reaching the wood beneath. Luckily the customer was updating the bathroom and caught this problem early. 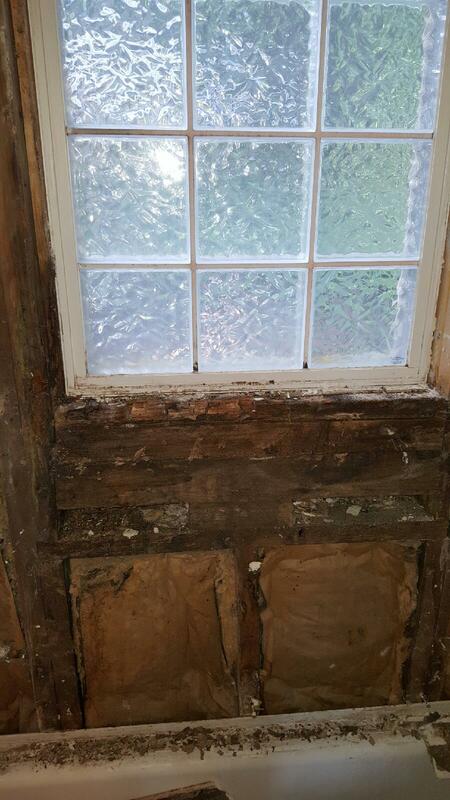 While the wood around the window was rotten, a few hours of repair work and it was good as new. Call in a Pro, The Shower Pros!